Starting midway through November, the green and red and white streamers appear; houses are bedecked with sparkling lights and buildings attempt to out-bling each other in outrageous green, red and white displays. Festive lights and decorations sprout along streetlights and across shop windows and children get restless in school waiting for the holiday. Except the red-white-and-green don’t signify Christmas but the UAE National Day, which is celebrated on December 2nd and commemorates the day forty-two years ago when the rulers of seven different fiefdoms signed a constitution and became the United Arab Emirates. Sheikh Zayed, the leader of Abu Dhabi and the first President of the UAE, died in 2004 and his likeness is everywhere on National Day. For those of you in the United States, imagine if George Washington or Thomas Jefferson had died only ten years ago and you’ll have some sense of Zayed’s very long shadow. For three years now, I’ve experienced a kind of cultural dissonance around National Day, as its colors and lights intersect in my mind with images of New York gussying itself up for the winter holidays. True, the UAE flag has a black stripe in it too, but when the buildings are lit up, they’re mostly lit up in what I think of as “Christmas colors.” In my Facebook stream (which as an expat sometimes almost seems like a real space rather than a virtual one), pictures of people celebrating Thanksgiving or decorating their tree bump up against pictures of cars wrapped in UAE flags and buildings displaying Zayed’s face in lights. Abu Dhabi prides itself on being a relatively open culture; there are expats living here from almost every country in the world. The international population means that that the city is a smorgasbord of holiday traditions, from Ramadan to Diwali to Christmas; I have friends here who (quietly) celebrate the Jewish High Holy Days, as well. 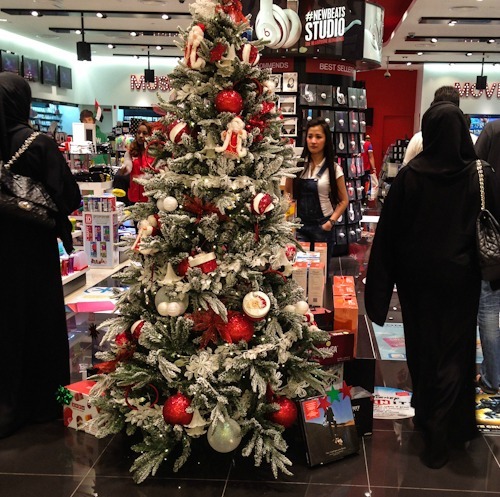 The malls and shops reflect this cosmopolitan community but in sometimes disconcerting ways: holiday Christmas displays feature Santa on a camel, or Christmas trees draped with UAE flags. It does seem, as Thomas Friedman wrote several years ago, as if the world really is flat. Friedman is talking about economics rather than cultural traditions but I’m starting to think that we can’t really separate the one from the other. Eventually, it seems, we’re all going to be living in versions of the same place: a mall. The other day, as we walked to the movie theater in the mall (in Abu Dhabi, everything is at some mall or other), past the prayer rooms and the Christmas trees and the UAE flags, my younger son said “How come people fight about religion?” I didn’t have an answer and he’s not yet old enough to be able to appreciate the irony inherent in his question: that in the “Middle East”, a phrase (and place) that still scares many people in the West, my son seems to be learning that different cultural practices can co-exist — not always comfortably but nevertheless without violence. So happy National Christmas day to you all: may Santa (or whomever) ride his camel to your house and leave you white, red, green, and black striped gifts, and may you all have a happy new year, no matter which calendar you’re using. This is a wonderful post! I can appreciate the irony of this heart warming message coming from the ‘dreaded Middle East’. I love your insight on this! Happy whatever to you too! I wish everyone a Peaceful Festive Season and the best New Year yet!